One of the first things I ever learned on a guitar was a short song made up of a few basic guitar chords. I can’t begin to tell you just how satisfying it felt to be able to play three simple chords on my guitar, which together produced the basis of “Wild Thing” by The Troggs. I can still remember the sense of satisfaction and the realization that I could actually learn to play the guitar if I put in the practice. In those days, before the internet, I couldn’t just hop onto the internet and learn to play guitar online from people across the other side of the world. Instead, I learned from friends and books. Just as good really – probably better to tell the truth because the stuff I learned was more tailored to my needs that a random search on the internet would be. Basic chords are not very difficult to learn and you’ll be surprised at the results you can get after a fairly short period of practice. They form the backbone of all music and once you’ve got the hang of a few basic chord shapes you’re well on your way to being a fully-fledged guitarist. The great thing about chords is that they last you a lifetime. Once you’ve put in the effort to learn guitar chords and got them under your belt, they are always there ready to be pulled out when you need them. The best way to learn to play guitar chords is, of course, to put in consistent practice. There is no trick to learning them, you simply have to knuckle down and play them over and over again until they become second nature and you don’t even have to think about it when you play them. When you reach that stage of automatically putting your fingers in the right place without consciously thinking about it, you’ve cracked it. That is what you are aiming for. You need good technique, and I’ll talk about that in future articles, but the main thing is a solid practice routine. There are 2 main types of chord – major and minor. Other types do exist but we can think of these as variations of the two main types. When you come across chords written down, the notation is very simple. The generally accepted convention for writing chords is to use the capital letter representing each chord. The capital letter on its own is used for a major chord and a minor chord is identified by writing a lowercase “m” immediately after the capital letter. 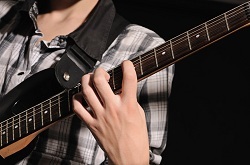 For a full run down of chord diagrams, see this article on Learning Guitar Chords. Major chords typically sound bright and confident, whereas minor chords sound more melancholic and sombre. The two types of chord are often used to change the mood of a musical piece to suit the effect the composer is trying to achieve. Well, The first chord I’d recommend any beginner should learn is E Minor (Em) because it’s just so simple to play. You only need to hold down 2 strings whilst playing all 6 of the strings and hey presto, an E minor chord! In fact, I’d say that a lot of the basic chords are quite straightforward to play, in themselves. The difficulty that most beginners have is transitioning between the different chords, with the attendant finger gymnastics that is sometimes required. Don’t worry about this for now, just make sure you’re comfortable holding down the 2 strings for an E minor chord and strumming evenly and consistently. Get comfortable playing this single chord and then you can move on to learning to play guitar chords as part of a progression, and practicing the transitions between them.